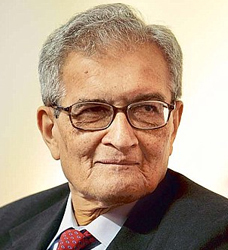 Amartya Kumar Sen, son of Amita Sen and Ashutosh Sen, was born on 3rd November 1933 at Shantiniketan, West Bengal. He received his initial education at Shantiniketan and then Presidency College, Calcutta. He was exposed early on to the plight of the poor. As a 10-year old child, during the Bengal famine, he was shocked to see people dying of hunger on the streets of Calcutta yards away from shops stocked with food. Three years later in Dhaka a Muslim labourer was killed in communal riots outside his house. The traumatic incidents directed Sen to a relentless study of the economic mechanism underlying famines and poverty. Amartya Sen joined Trinity College, Cambridge in 1953. He became the youngest chairman of the Department of Economics, Jadavpur University, at the age of 23. Between 1956-1998 he was Professor of Economics at various Universities in India and abroad. Sen's contributions on welfare economics and definition of poverty in relation to development have offered a new philosophy and an alternative way to solid economic development. He was of the opinion that the World Bank system of ranking countries according to the GNP and saving rates was not enough and he helped to create the United Nations Human Development Index which has now become the most authoritative international source of welfare comparisons between countries. Some of his works include ' Choice of Techniques', ' Collective Choice and Social Welfare', ' Poverty and Famines', ' Development as Freedom' etc. Sen is the sixth Indian to get the Nobel and the first Asian winner of the Economics Prize. Some of the honours to his credit are 'Indira Gandhi Gold Medal Award' of the Asiatic Society (1994), 'Nobel prize for Economics' (1998) for his work on ' The poorest people in Society', 'Eisenhower Medal' from USA (2000), 'Honorary Companion of Honour' from UK (2000). He also received 'Bharat Ratna', the highest civilian award in India. He has been honored with Honorary D.Litt degrees and fellowships of a large number of Indian and Foreign Universities and Institutes of repute. Now living in Cambride, Massachusetts with his third wife, an economic historian Emma Rothschild, this genius has spent a lifetime fighting poverty with analysis rather than activism.